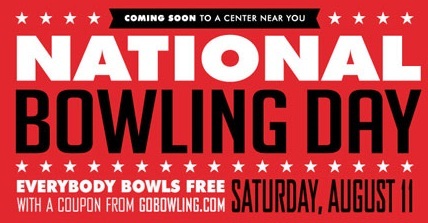 Celebrate National Bowling Day on Saturday, August 11th with a free game of bowling! Bowling is the #1 participant sport in the country with over 71 million people hitting the lanes every year!! To get your free game of bowling, simply head to GoBowling.com or "like" the GoBowling Facebook page to get one free game coupon. Then your family will be on their way to strikes and spares at any participating center across the county.